So Why Would I Buy a DJ Controller? My new PioneerDJ DDJ-1000 in my home office. 2 years ago, I pretty much set up the ideal DJ Rig in my studio. 2 XDJ-1000mk2’s, DJM-900NXS2, 2 1200 Technics MK2 in a custom-built DJ booth. I added the PioneerDJ AS-1 and DJS-1000 last year and I pretty much can do anything I want as a DJ with this rig. I dubbed it “The Beast”. I have made several new mixes on this rig and I love DJing on it. It’s just too much fun. So why the need to have a controller? Well It’s a couple of reasons. First of I am a DJ and I love technology. I love how technology changes things that were once familiar. I have always followed DJ technology. I didn’t tend to always get the latest and greatest throughout my years. In fact, I think in the 30 plus years of DJing I have only owned 5-6 different mixers. I saw my friends and peers move into the time code vinyl and while I appreciated the technology I didn’t want to move into that direction because it looked like so much of a hassle to set up. I just didn’t really want to DJ with a laptop too. I vowed I wouldn’t be one of “those DJ’s”. However, I was not opposed to going digital and I did so in 2006 with CDJ’s and then moved over to USB’s only in 2013. I always wanted to have something I could use in a mobile type situation though. My Studio DJ Rig, AKA The Beast! 2 years ago, I DJed at a wedding and took a lot of my gear. I used to do the mobile DJ thing when I was in high school, so I was used to it and since this was a one off, I didn’t really think of getting something more mobile. I did tell myself that if I got more wedding gigs that I would get a controller. Earlier this month I did another wedding and this time I only too my XDJ’s that we plugged into my friends Pioneer DJ controller. This was ideal because we were both able to DJ with the style that best suited us. After this gig though I decided to get a controller for mobile use. The debate was to go with something like the new PioneerDJ DDJ-1000 or an all in one unit like the XDJ-RX2. I have used the XDJ-RX several times and I liked it, however I was hoping that when PioneerDJ came out with the second version that they would include 4 channels. They did not. Darn. So, when I saw the DDJ-1000 at NAMM this year, I thought this could be what I wanted to use. It was light, super portable, full size jog wheels with new display’s in the center of them and 4 channels. The only thing was I would need a laptop. After debating for a while I decided to go with it. I have a dedicated laptop that I could use with it and it would be perfect to set up in the house, take it along to gatherings, take it to BBQ’s. Etc. Now that I have had it in the house for a few days, I have to say that I love it. It is so nice to be able to just DJ whenever I want. No need to get into the studio if I want to practice. I can just go into my home office and play a little. I did that this morning in fact before I went into work. I just played some tunes while I had my morning coffee. I can get used to this! I have been DJing now for about 30 years. I started when I was 13 in Junior High spinning on Realistic Turntables and Mixer from RadioShack. I was hooked. When I had the opportunity to purchase Technic 1200’s, the industry standard turntable when I was 18, that changed my life. I pretty much kept the same set up for years. I wouldn’t buy the latest mixer. 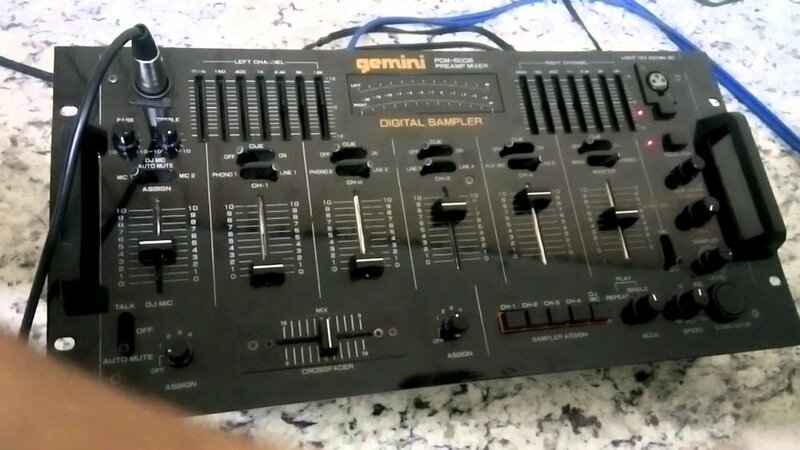 Most of my mix tapes in the 90’s was done on a Gemini PDM-6012. I wouldn’t upgrade my mixer until 2000 when I purchased the then industry standard PioneerDJ DJM-500. And that is what I had for years. I saw the digital age coming. I saw my friends and colleagues moving to new technologies. I saw people starting to set up Serato and Final Scratch and use timecode vinyl. I witnessed the CDJ-1000 starting to infiltrate DJ booths at clubs everywhere. I belonged to the Balance Record Pool and saw it slowly move to CDs and then to files. I knew I would have to make a change. The Gemini PDM-6012. Many of my classic mixes in the 90's was done on this piece of gear. I started DJing with CDJ’s around 2004-05. I didn’t have my own players yet but I was able to use them at gigs along with vinyl at the time. The big switch for me happened in 2006 when I bought my first digital decks. I picked up 2 CDJ-800MK2’s and pretty never looked back. I tried using Abelton but looking at a computer screen just wasn’t fun for me. The CDJ allowed me to still scratch and treat files in a way that I would treat vinyl with a significant price cut. What would cost me 4 import records would now afford me a night’s worth of new music on platforms like Beatport and Trackitdown. To me it was the best solution. I had the best of both worlds. Tactile feeling and control and instant gratification. I was producing a lot of music at the time too so it was really easy to now try my tracks out in mixes and at gigs. How fun was that. Create, play and check the vibe. The Pioneer CDJ-800mk2. These were my first commitment into going digital. This was all fine and good for a number of years. In 2013, I was DJing with Rob Pointer as Stylus and he bought a full Pioneer Nexus system. I hadn’t really utilized Rekordbox before but the idea of being able to just play off 1 USB drive intrigued the hell out of me. Once I tried that, I was hooked once again. Now I could have several years’ worth of music at my disposal without carrying a bunch of CDs around. I loved the idea of getting rid of the physical component of the media format and just focus on the music. I found myself throwing out all my CD’s and placing everything on USB. My only gripe at the time was the cost factor of the CDJ-2000Nexus units. I remember thinking why doesn’t Pioneer get rid of the CD Drive all together and move to a just a media player. My prayers were answered the next year when Pioneer introduced the XDJ-1000. The form factor was right. The price was right. It was finally time to upgrade. 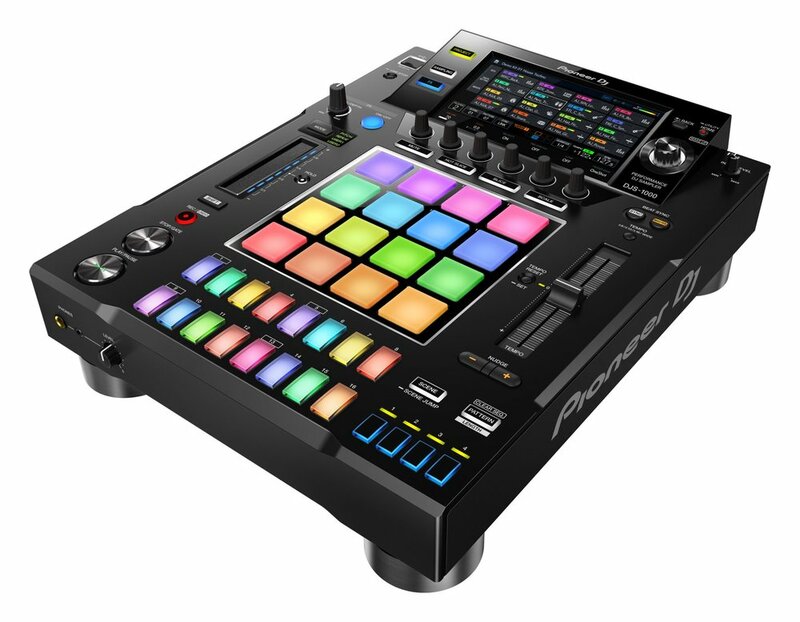 The all new PioneerDJ DJS-1000 Standalone DJ Sampler? I was debating for a period of time whether or not I should get a controller such as the XDJ-RX or get two XDJ-1000’s and DJM-900 mixer. I also wanted to incorporate vinyl into my set up so it just made sense to go with the DJM-900 route. I was lucky enough to upgrade to the Nexus2 mixer and the MK2 versions of the CDJ-1000’s. Also picked up the RMX-1000 and when I felt I was all done and content, Pioneer announced the Toraiz SP-16. The SP-16, for those that do not know is a stand-alone sampler that can also tie into the Pioneer DJ Ecosystem by using the DJ Link. The idea of having a sampler that I could easily tie into my DJ gear was something I couldn’t pass up. I purchased one and started playing around. Then earlier this year, Pioneer DJ dropped their first synth, the Toraiz AS-1. I was able to play around with it at NAMM in January and quickly got one when it became available. What I liked about this, is that now I could do more than just play tracks, I could add to and embellish things on the fly. I could easily create my own grooves and bring them into the mix. I started experimenting with it is being called “Hybrid” DJing. Taking the elements of traditional DJ and adding live synths and samplers. It totally intrigued me. After 30 years of DJing this felt totally brand new to me. I have friends that work for Pioneer DJ so it was little surprise to me when they announced the DJS-1000 stand-alone DJ sampler. I knew it was coming and I actually wanted that piece. I was able to quickly sell my SP-16 and get the new DJS-1000. I fully plan on utilizing this piece of gear along with the AS-1 in my gigs. 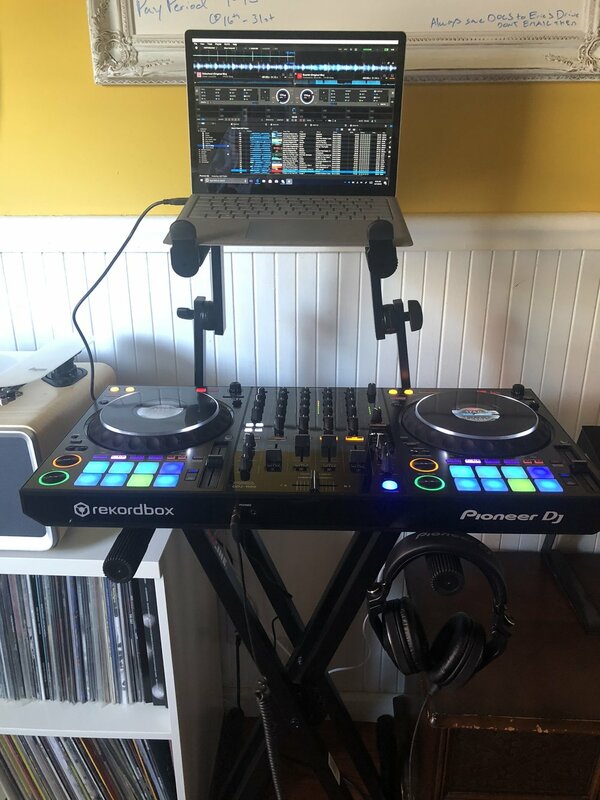 To me this really introduces a new way of approaching DJing, where you can be nimble and spontaneous but also plan certain elements out that enhance what you are doing behind the decks. It is honestly a fun time to be DJing and seeing where DJ technology goes to next. The future is bright.